It's a fun weekend, this, and we have been sharing some useful and fun tools while at it! So here's our chance to go a little bit further! We know you all use Facebook, and must have seen those rage comics and fun memes circulating around faster than wildfire. Funny, comic images on Facebook, in simple words. The word 'meme' comes from a Greek word meaning to copy something. A meme is usually viral, and spreads around from person to person, much like a virus. On social media, these fun memes are much like viral videos, only, much more viral, because they're easier to watch, and people like them. So you've got an idea for a funny comic or meme? Here' we will share the top 5 sites where you can create your very own memes and trolls for free, share them on social media and see them go viral all over the world! The more observant among you might be wondering, why has this post been filed under marketing? Well, don't think it's a mistake. Indeed, images are a great help when you're marketing your brand. They spread faster than anything else. When someone likes an image on Facebook, it appears on his friends' news feed, hence giving your image more exposure. And images are easily scan-able, especially comics, which the people like, and pause on particularly. Hence, it's a great marketing strategy to upload memes that are fun, and related to the products/service you deal with. All these meme generators work much like each other. You pick a basic meme, add a caption or words, create meme, and then share it on social media. Some will give you the option to download the image. But it's easier to just share the memes right away. 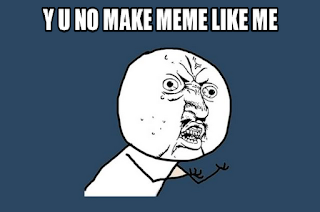 So here goes our list of the top 5 meme generators you can use for free. Create all sorts of memes, or create your own custom character using this advanced Meme Generator.